For the past few years, I’ve approached the Bahrain race with a feeling of resignation – it is not going to be a classic but it’ll pass a few hours on a Sunday. As it turns out, this year, the racing was incredible. Whether it was related to the move to a night race, or just a handy coincidence, I don’t know, but from the moment the start lights went out on Sunday, you couldn’t spare a moment to blink. It’s surprising what a chaotic and action-packed race it was, considering the quiet start to the weekend. Last week, I talked of Mercedes working their poor drivers far too hard in the run-up to the Malaysian weekend, but in Bahrain, it was hard to see anyone was doing anything. Back to back races mean there isn’t too much down time from one to the other, but it seemed as though most of the paddock left it as late as possible to arrive in the desert. Once there, the PR opportunities seemed few and far between, with just a handful of meet and greets, and the more traditional press conferences. It could be that two races in as many weekends is just too gruelling a schedule for F1 these days, or it could be that F1 just isn’t popular in Bahrain and thus there is no one to market wares too. I know which I think it might be, but after the race we saw on Sunday, there could be more interest in the sport this time next year. Where Mercedes are dominating on track, Williams are winning the war in the paddock. Having soaked up all the headlines after Malaysia due to their team orders debacle, the squad came to Bahrain hoping to make amends. They suggested that all was well between the drivers, and got on with the job in hand, dispatching deputy team principal Claire Williams to the press circuit and development driver Susie Wolff to Sky F1’s broadcasting team, ready to answer the difficult questions. Wolff commentated on a practice session for Sky, and then spent a good proportion of weekend build up with the TV crew as well, and she handled every single question thrown at her like a pro. Honest and humble, whilst at the same time being strictly on message, she deflected talk of problems between the drivers, any tricky power unit prying, and came out of it looking pretty good. I wonder if this isn’t a lot to do with Claire’s media training. Having worked her way up through the team ranks via the PR & Communications route, she knows how to handle the press and the difficult questions. Williams appeared a little flustered when Ted pressed for information direct after the race last week, but overall, there’s a degree of professionalism that can only come from having dealt with the media for years. Meanwhile, new boy Rob Smedley could learn a thing or two. All eyes were on the ex-Ferrari engineer as he made his debut in the new Williams stripes this weekend. For almost every question he was asked, he took the opportunity to expound on what a professional outfit Williams are, and how impressed he is by them. On the one hand, he clearly means this as a compliment. On the other, it sounds very much like he was expecting them to be a shambles. Which is sort of the opposite of the praise intended. There were a handful of celebrations going on in the paddock, with the first being the very reason it was a night race. Bahrain's decision to switch to a night race was put down as a marker of the tenth anniversary of the event, but as they look set to continue the tradition going forward, it's likely it was just a ruse to get the floodlights out. Meanwhile, Formula One as a whole was celebrating the 900th race, which is a great milestone but not quite as great as 1000 will be. Toro Rosso were proudly celebrating their 150th race, whilst Force India were clutching at straws to get a tenuous anniversary out of 400 Grands Prix for "Team Silverstone" (ie. all iterations since Jordan). Jenson Button was the one handing out t-shirts, however, and refusing to speak to Martin Brundle on the grid because the broadcaster wasn't wearing one. His 250th Grand Prix didn't end as he might have hoped, dropping back after the safety car restart and eventually retiring. Button still has a way to go to catch up with Rubens Barrichello's 300+ race starts. Of the 900 Formula One races there have been, Rubens managed to drive in more than a third of them. Go Rubens! The list of penalty points is really starting to stack up now, with no less than five drivers already with points on their licences after just three races. It's too early to judge if the rate the points are being handed out is right or not, but it is a surprise to me that Jules Bianchi is the driver with the most points so far. Whilst on the subject of stewarding, I quite enjoyed the appearance of the Race Control message during qualifying for the Bahrain Grand Prix, wrongly implicating Fernando Alonso in an incident. That, to my mind, is someone who is super proud of having learned all the driver numbers and just getting a little bit carried away. Having previously expounded on the subject of seeing more fresh drivers appearing in practice sessions this season, it was nice to see that finally come into effect in the third round of the season. Quite understandably, teams have been focusing on getting their race drivers up to speed as they continue to adapt to the many changes of the 2014 season. For Bahrain, however, we had three drivers stepping into the cars of others. Robin Frijns got his first chance in the Caterham, and he managed to finish a couple of tenths up on Marcus Ericsson, completing a full 35 laps. 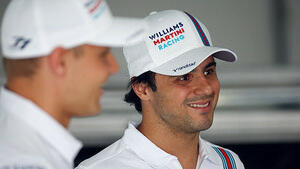 Felipe Nasr was in the Williams on Friday, but ended up half a second down on namesake Felipe Massa. That's comparing all the experience in the world with a fresh-faced tester, though. Finally, of course, we got to see Giedo van der Garde make his debut appearance for Sauber. He's been hanging about on the pit wall for the past couple of races, but the Dutchman got back behind the wheel of an F1 car, having been ditched by Caterham last year. I am quite pleased how the session went, taking into consideration that this is also the first time I have driven the car with the new engine. I am happy so far. I hope we can work with the feedback. It was a nice warm up for next week, when I will have one full day of testing. He will be back in action this week, as the first of the two-day post-race mid-season tests gets underway in Bahrain. Plenty of the drivers have been catching some sun whilst they wait for the test to begin, and it'll be a good opportunity for teams to make use of the data they've gathered over the past few races to improve on their 2014 machinery. I can't wait to see what they bring to China!